Other spring games if y’all want as well I guess. Defenses looking pretty good at Clemson so far. Offenses haven’t had much so far. Swanson just had a monster punt, that dude is going to be a HUGE weapon for us. Going to be so refreshing to have a good punter again (even though I hope we don’t see him much). Chase Brice just led a great drive to score, man I have a lot of love for Brice. Great talent who was buried on a QB depth chart and has hung tough and provides a really solid backup option for us. Guy is fully capable. Crowd looks good. People across the whole lower bowl, not capacity lower bowl by any means, but a good showing. Also, the ESPN coverage is fantastic! They have Galloway and Herbstreit on the field and Dabo just being Dabo giving them all the content they need talking about each play call. Once you get him going he doesn’t stop. No real need for a guy in the booth. Great coverage for Clemson. Man the mid years are looking good already. Ladson and Ngata especially. White team took it to the orange team today. I was pleasantly surprised with our LB and DB play today (Jones a mid year looked great). I feel like our RB corps could be deeper than we realize. Saw a little bit of TE involvement also. I’m so glad we actually run a real game spring game. Apart from hitting the QB, it’s pretty much all live. I’ve thoroughly enjoyed watching this spring game today. A couple hours long commercial for Clemson, doesn’t get much better. On field coverage was awesome. And they unveiled the championship rings. I also hope Bresee had a good time and the 5 other 5* players there today. Oh and in Columbia they had about 1/5th of the lower bowl filled and stiffed 2 pizza delivery drivers. Paid a $5 tip on a $1900 pizza order for 2 drivers to split. Ray Tanner admitted it was true. At least 1 driver was a coot student. Latest story I heard was the USC staffer who took the delivery did not like how the pizza was a bit cold and falling out of a box, so her and the driver kind of copped attitudes and the staffer gave them $5 tip to split. I guess coots aren’t smart enough to throw a pizza party. When Dabo did it he ordered from multiple different locations to ensure speedy, hot, fresh pizza instead of overloading one place for hundreds of slices. Of course the pizza was cold, it took 2 drivers 2 trips to deliver all of the pizzas you ordered. So good it happened to them though. Here is a visual comparison of Spring games. Yea I heard the same. No pizza place can make and keep warm $2000 worth of pizza. This was one of the more entertaining Spring Games I’ve seen. Dabo shows how he is a very clever guy at finding ways to sell the program. By giving the ESPN crew the chance to be on the field and pretty much hang with him and interact gives potential recruits a unique look at the program. Could you see Nick Saban allowing such access? No way. Dabo is so comfortable in his own skin and you could tell he, the players and his staff are having fun while developing these players. I loved how he literally spiked the ball during the ring presentation at halftime with the dropping the microphone moment. The Football was pretty good too. As has been said, the young defensive talent looked good. I was also glad to see we have more good looking WR’s and a TE that appears to be a an step up from Milan Richard. I was also impressed in how the were allowing blitz’s. Even the ESPN guys were surprised to see them dialing up the heat. All in all it was a good event were there didn’t seem to be any injuries. Now is the time to get stronger, stay in the books and stay out of trouble and get ready for the fall. That was great TV having Dabo talking with Herbstreit and Galloway on the field. The young talent was really impressive. The receivers looked great as did some of the young defenders. Sheridan Jones is going to be great. The punting looked great too. Cha CHING! Fred Davis II, 4-5 star DB out of FL just committed to Clemson. 2 great DB commits in just a couple days, I like it. 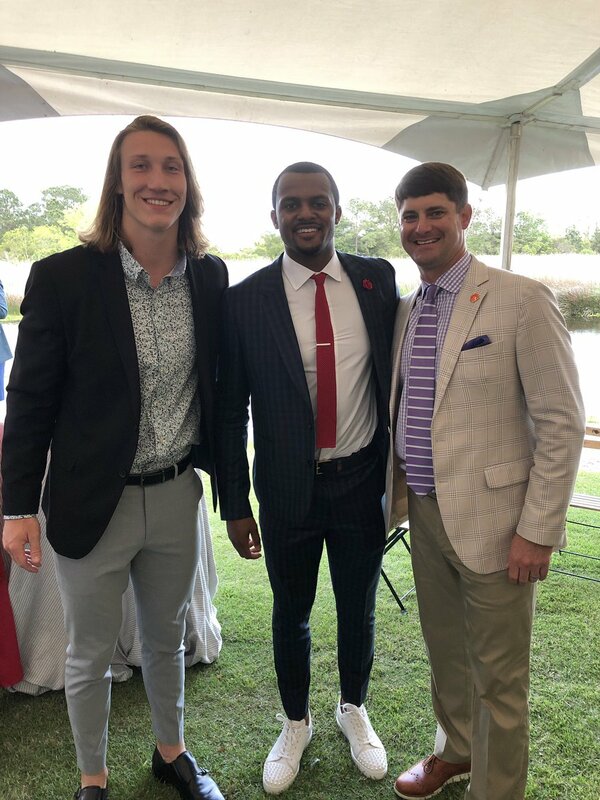 Yo, Trevor Lawrence makes Deshaun Watson look undersized by a mile….oh man.